Back in the ‘60s, most American compacts were simply smaller renditions of larger cars, shrink-i-dinked to take up less space and at a lower cost. Today's Nice Price or Crack Pipe Cutlass takes that concept to inverse extremes, but is its price still disproportionately too large? There's nothing more inspiring than an individual succeeding in the face of adversity. Such was the case with yesterday's Fairmont Drag wagon which despite the challenge presented by its synchro-free gearbox succeeded not only in being daily driver lust worthy but also in smoking through the traps to the tune of an 80% Nice Price win. Now that we've tamed the Dwagon, it's time to get small. . . sort of. You know, people's actions frequently defy explanation. Years ago, while training for my Emergency Medical Technician (EMT) license, I had to do rotations in a local hospital's emergency department. I always chose the overnight shift because they said that's when the weird stuff came in, and if you know me you'll know I like the weird stuff. The weirdest stuff of all, I would come to learn, was the people who did stuff to their butts. One particular incident that I recall (don't worry, it was pre-HIPAA) was a guy who came in red faced, sweating, and doubled over. The ER doc working that night had little compassion for individuals who put themselves in situations like this and didn't even bother to pull the privacy drape when he instructed the patient to drop trou and bend over the gurney. Pulling up a stool (no pun intended) the Doc proceeded to delve into the depths of the groaning individual's man cave only to suddenly jump back from the work at hand with a startled look on his face and an involuntary exclamation - "Jesus H Christos!" What had shocked the Doc was the source of this poor fellow's discomfort, a double C-cell Eveready flashlight, pointed outward and inexplicably turned on. The ER doc had not expected to be greeted by such a startling luminescence from where, typically, the sun don't shine. Regaining his composure, the doc asked the patient, "what do you want me to do, take it out or change the batteries?" So now you may ask, what does personal physical introspection that requires an ER visit have to do with today's 1967 Oldsmobile Cutlass Faux 442? Well, have a look at the picture up above and you'll get an idea that the idea to cut more than two feet from its length may have stemmed from the same sort of inward thought and/or boredom. Looking like something ‘60s-era clowns may have spilled out of like a technicolor yawn of frivolity, this black over red Cutlass coupe is so freakishly disproportionate that its visage is almost mesmerizing to witness. The thing of it is, while the why of this car seems inscrutably out of reach, the how appears to be extrordinarily well executed. It's sort of like if Dr. Frankenstein assembled his monster out of parts from the cadavers of anonymous villagers only to come up with a bolt-necked George Clooney. The ad claims the car to be a 442 clone, and sure enough there, under the hood, lies the massive Olds 400 topped with a Rochester 4BBL. Missing are the red fender liners of a real W30 car, but with so much that's "off" about this one, why pick nits? Of course, this being presented as a shrunken clone opens the door to all sorts of Dr. Evil & Mini Me references, so go nuts. Aside from the fact that it's missing a good bit of its middle, the Cutlass is described as still being factory optioned, with A/C, power this and that, and a cool quartet of Super Stocks wrapped in meats by the General. It's also said to have been in a 1999 magazine, but what sort of fetish rag that might have been is beyond imagining. 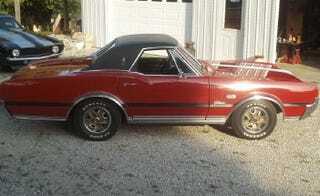 Of course not beyond imagining is the purchase of this Olds, or so the seller hopes. He is offering it up for a healthy $12,500, and it is safe to say that part of his pricing is based on the car's uniqueness, as it's unlikely you'll find another on the market. Do you think his price is selling the car short? Or, do you think that his getting that much will prove a long shot? You decide! Also, no calls after 10! 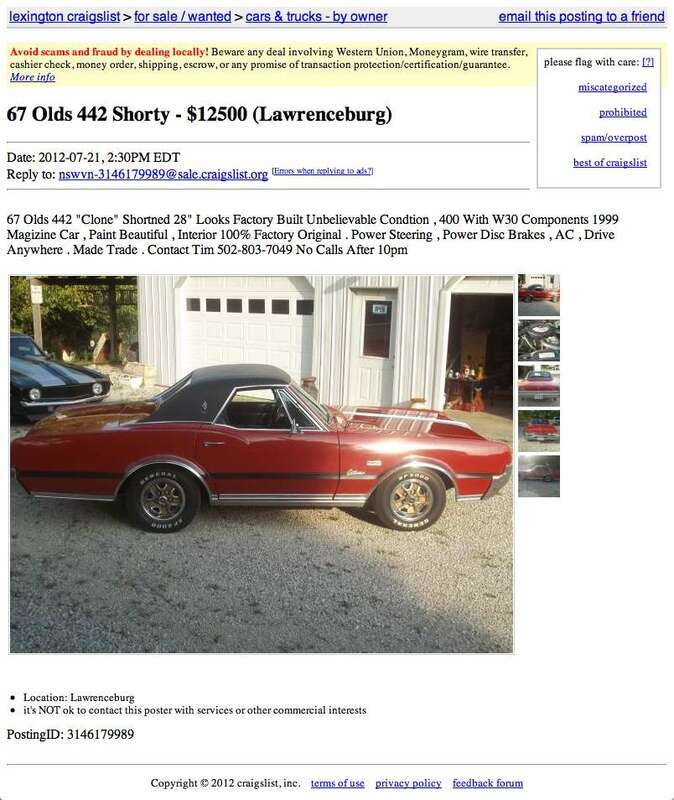 Lexington Craigslist or go here if the ad disappears. H/T to Delta Five Nine for the hookup!